Quickly and easily estimate the impact of change with 300 proven photonics calculations! This book is updated with 100 completely new and improved rules and organized into 18 chapters that include lasers, detectors, optics of the atmosphere, and many more! Here is a handy compilation of 300 cost-saving, think-on-your-feet photonics rules of thumb designed to save you hours of design time and a world of frustration. Within seconds you can accurately gauge the impact of a suggested design change on your project. It is the premiere collection of these valuable rules in a single, quick look-up reference.These simple-to-implement calculations allow you to rapidly pinpoint trouble spots, ask the right questions at meetings, and are perfect for quick sanity checks of last-minute specifications or performance feature additions. Offering a convenient alphabetical arrangement according to specialty, this unique reference spans the entire spectrum of photonics, including: eighteen chapters covering optics, electro-optics, optics of the atmosphere, radiometry, technologies related to security and surveillance systems, lasers, and many others. 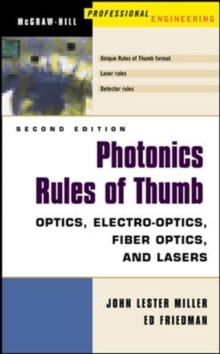 If you want to develop a sense of what will work and what won't and want the calculations to keep things real, "Photonics Rules of Thumb" belongs on your desk or in your pocket.